Storm Brian has eased after the UK saw gale-force winds and high seas, although disruption was not as bad as had been feared. Gusts of 78mph were recorded in Capel Curig and Aberdaron, north Wales, with 84mph recorded on the Isle of Wight. The Environment Agency said three properties had been flooded in the upper Calder Valley in West Yorkshire. There are Red and amber flood warnings in much of northern England and people are urged to "take immediate action". There are also flood warnings in place in the South West and Wales, while the south of England and London were under yellow wind warnings. The storm comes after three people were killed and hundreds of thousands of people - mostly in the Irish Republic - were left without power after the remnants of Storm Ophelia battered the British Isles after weakening from its earlier hurricane force. Strong winds and high seas first reached the western coast of Ireland overnight on Friday. Gusts hit 80mph (130km/h) in the country, said Irish weather agency Met Éireann, and there was flash flooding in several Irish cities, including Limerick. A race meeting at Fairyhouse was cancelled and the Cliffs of Moher tourist attraction in County Clare was closed. In Wales, trains and ferries were cancelled and seafront roads closed as a result of the weather. Natural Resources Wales said the coastline was likely to be "extremely dangerous this weekend". A lifeboat was sent to help a person in difficulty at Skrinkle, while Porthcawl RNLI warned people to watch the storm waves on its live feed, after people were spotted taking photographs from the harbour wall. Ceredigion council also warned people to "keep away" from seafronts and "be careful" on low-lying land where coastal flooding was possible. The Environment Agency has issued 30 flood warnings - meaning flooding is expected - in the north-west and south-west of England. 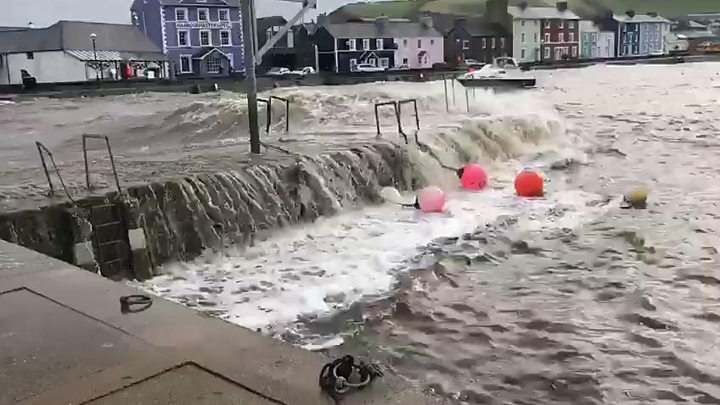 Flood barriers have been put in place in areas including Fowey in Cornwall, but Frank Newell, from the Environment Agency, said the surge had been lower than forecast. "In terms of impact, we've had spray overtopping quaysides, but we don't have at the moment any reported property flooding," he said. In Wales and southern England, fallen trees and other debris on railway tracks caused cancellations and disruption on some lines. The Environment Agency's national flood duty manager, Ben Lukey, warned people against posing for photos during the hazardous conditions. 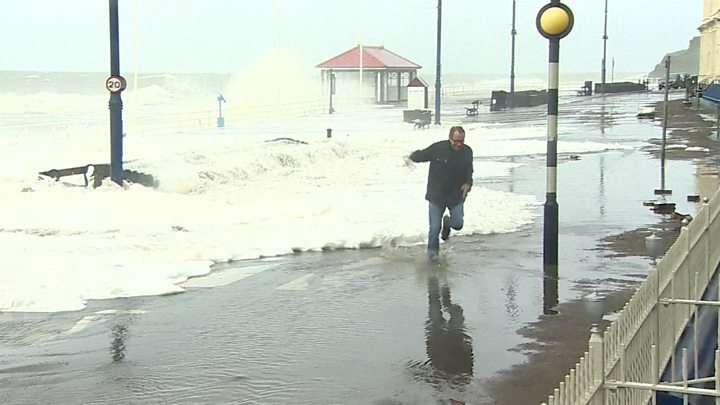 He said: "We urge people to stay safe along the coast and warn against putting yourself in unnecessary danger by taking 'storm selfies' or driving through flood water - just 30cm (11in) is enough to move your car." Have you been affected by Storm Brian? If it is safe to do so, share your pictures, video and experiences by emailing haveyoursay@bbc.co.uk.